Dino Polska S.A., a Polish grocery store network that is one of the fastest growing networks on the retail grocery market in Poland, posts rapid sales growth (+30.8% to PLN 5.8 billion), including a very robust level of like for like sales (LfL, +11.6% y/y). The Group also reports further profitability growth. The EBITDA result climbed 34.8% while the EBITDA margin rose 0.3 percentage points to 9.3%. The Dino Polska Group invested PLN 634 million in 2018, predominantly in ongoing store rollout and a new distribution center. In 2019, Dino Polska intends to earmark PLN 850 million for investments, similarly to last year, chiefly to expand the Dino store network and distribution centers. The significant growth in the Group’s scale of operations – the pace of growth topped 30% for the third year in a row – is the outcome of its ongoing rapid store network rollout and the double-digit growth in LfL sales revenue (like-for-like). In 2018 the Dino network saw its store number count grow in parallel with a substantial increase in the average ticket. “We owe the pace of growth to our clients – those people who do their shopping in Dino regularly and new customers whose trust we are constantly working to gain. We are consistently opening new stores for them – in the near future we will open our 1,000th store – because we know that they prefer to buy groceries close to home. To respond to their needs the offer presented by Dino stores is to a large degree based on fresh products”,said Szymon Piduch,President of the Management Board of Dino Polska. In 2018 Dino Polska opened a record-breaking number of stores: 202 compared to 147 openings one year ago (+37% y/y), meaning that at the end of December 2018 it had 977 stores. The objective is to continue ramping up the number of new store openings. We would like to maintain the fast pace of our company’s growth in upcoming years. The market environment that is conducive to the Polish grocery market, combined with our tried and tested store format, offers ample opportunities for further expansion. We are increasing the density of our store count; we are also gradually extending our reach to include new areas, thereby enabling us to transform into a nationwide network in a sustainable and financially effective manner. As we grow our scale of operations, we intend to work to sustain our high level of LfL sales”, said Szymon Piduch, President of the Management Board of Dino Polska. The fourth distribution center opened last year in Rzeszotary in Lower Silesia supports the network’s expansion. Further headcount growth will accompany this intensive growth. In 2018 alone, the Dino Group created 3.4 thousand new jobs and at the end of the year it had 16.5 thousand employees. “In 2019 we have set ourselves a goal of opening a higher number of Dino stores than last year, and we are well poised to accomplish that. In response to customer needs we will regularly align the product assortment offering available in our stores by relying chiefly on branded and fresh products. The conducive market conditions and Poles’ growing spending are adding momentum to the grocery trade. Our country is in the top ten of European member states in terms of the pace of growth in grocery trade”, adds Szymon Piduch. 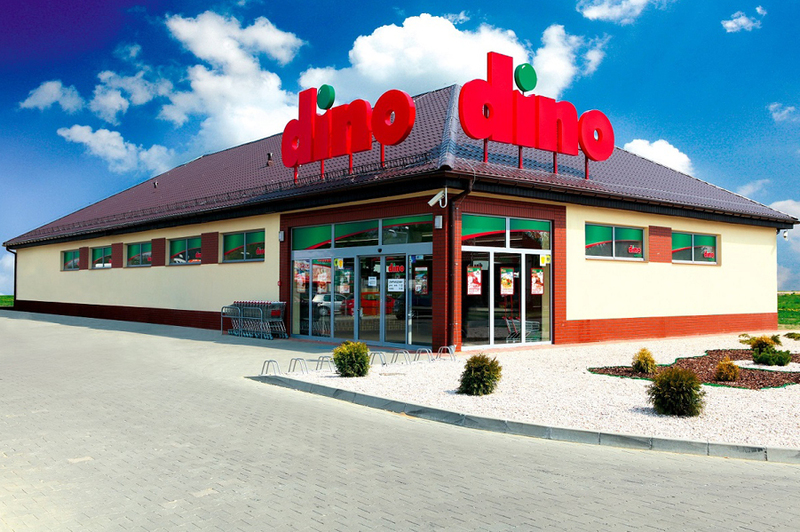 In accordance with its strategy, Dino Polska will exceed 1,200 stores in 2020 and intends to continue its rapid expansion in the following years. The Group estimates that the total value of its investments in 2019 will be PLN 850 million. The bulk of its capital expenditures will be used to expand the store network and logistics functions. The retail grocery market is growing regularly despite the Sunday trading ban introduced in March 2018. The grocery trade is underpinned by robust macroeconomics: rapidly growing GDP (5.1% in 2018), payroll growth, record-low unemployment (5.8% at the end of 2018). Poland’s GDP in Q4 alone was +4.9% y/y versus +1.2% y/y in the euro area. 2018 saw food price inflation of 2.6%. The National Bank of Poland’s forecasts posit GDP growth of +4.0% in 2019, +3.7% in 2020 and +3.5% in 2021. The fiscal proposals announced by the government, including the extension of the 500+ program may constitute an additional stimulus supporting the grocery trade sector. “The retail grocery market is growing by roughly 4% per annum. Dino Polska is growing faster than the market and we continue to see tremendous opportunities for our store network expansion”, summarizes Szymon Piduch.